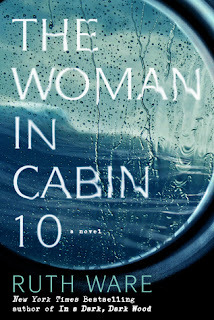 * I was given a copy of The Woman in Cabin 10 by NetGalley for an honest review. Thank you NetGalley, Gallery Scout Press, and Ruth ware for sharing with me! I picked this book up on Wednesday evening and finished it by Friday morning. I wish I could have read it without stopping, but something called "work" got in the way. Needless to say, the book was incredibly fast paced and extremely hard to put down. Ware creates such a creepy and realistic environment that I often felt as though I was on the boat with Lo, helping her investigate. The summary of the novel describes the book as being "reminiscent of Agatha Christie's work" and I would have to strongly agree with that statement. There was never a single moment when I thought I would be able to figure out the ending or what would happen next. The writing was crisp, to the point, and I never felt as though I was reading pointless fluff. The novel is set on a cruise ship which gives the reader a feeling of being trapped with nowhere to run or hide. I often took pity on Lo and the constant fear that she was feeling. If you are a fan of Agatha Christie type mysteries, I would strongly recommend this book to you!